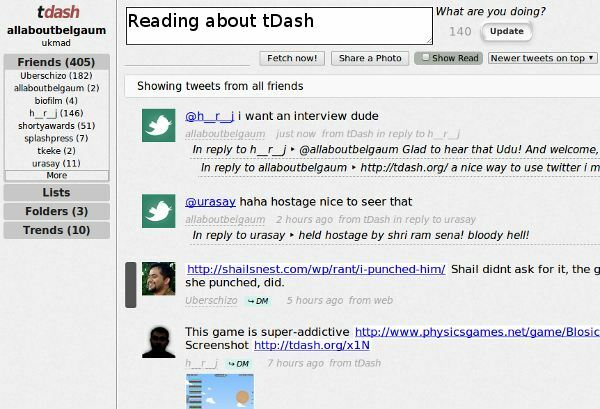 tDash is a Browser-Based Dashboard for Twitter. tDash has been developed by Belgaum based Harshad Joglekar who wanted to tweet but in a easy manner and not in the regular Twitter format. And the best thing this gentleman is part of the ITBelgaum initiative. The developers of tDash designed it to look similar to that of the Google Reader interface. The ability to mark tweets as read, and thus to narrow down the user’s attention to tweets that are as yet unread. Plus it has Keyboard shortcuts to make it fun and easy to use and is safe because it allows you to sign in using the OAuth. No need to give out your password. It is great too that you will not be required to install any software it is web based. So if you are looking for a new tool to use, try it out and let us know what you think. It’s an experiment, an attempt, to take Google Reader’s organizational ability and apply it to Twitter. It has been designed for Tweeple who continuously read Twitter. Developers have strove for a minimalistic design and for ease of use. There are keyboard shortcuts for just about everything; no more frequent lunges at the poor mouse. It is entirely web-based. No need to install anything. For that matter, no need to uninstall anything if you get bored of it. Mark a tweet as Read. As soon as you select a tweet it gets marked as read and then it magically gets out of your way the next time you view that folder. (If you still want to read it again, there is an option for that). Support for Twitter Lists. It’s a great way to organise them tweeple. Too big to explain here. Login via Oauth. Play safe. Enough said. 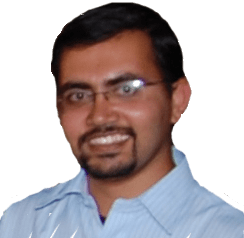 A small Interview with the developer Harshad Joglekar: He has done his schooling from St.Pauls High School and his engineering from GIT. What really inspired you to make this app? Call me selfish, but I am most inspired by ideas that directly solve some problem affecting me. Of course, in the process, I also hope that the idea solves a similar problem that others might have and hence serve a wider audience. The idea for tDash followed the same pattern. 2009 was the year that Twitter became really popular outside its early-adopter circle. I was hooked immediately after trying it for few days. The best thing about Twitter is that it is quick and easy, and it forces you to write short, succinct messages (max 140 chars), unlike other social networking sites like Orkut, Facebook and the latest one on the radar, Google Buzz. As I used Twitter more I realized that it would be more useful if messages (or Tweets as they are popularly called) would be organized in some way rather than as a long flat list. tDash is a result of my experiment with that problem. You have a out of the box thinking, what do you eat or drink for that? Do I think out of the box? Now that you mention, perhaps I do have that tendency.. But hey, I can’t reveal what I eat or drink for that. I will be lynched at home! Oh, and one more thing. I have a lot of interest in observational astronomy. Apart from the great time we have on field trips which we call star parties, I think it also shapes a person’s perspective. This app looks good but what about monetization? I develop tDash as hobby project. Other than my time it doesn’t cost much to keep the service running. So, I am not worried about monetization at this stage. Ad based revenues is an obvious option to monetize but I think it is tricky to keep the user experience intact with Ads. Who else has helped you develop this app? Apart from that, I get a lot of ideas and feedback from users of tDash themselves. Converting some ideas that I have into products (mainly software), and in the process, helping solve some problems that the common man encounters. And having a good time along the way. There is one idea already in the pipeline, but I can’t talk about it until it’s completely ready. @Sandeep @Vikrant Thnx for your support! Hey its wonderful to see such new ideas coming from you, Harshad! great work! That is a good application. So then when will you start marketing it? The colour needs to be changed. Good you have kept it basic. Is it accessible on the blackberry. will give it a try!